A number of years ago at a dinner hosted by Corporate Knights, Lord Nicholas Stern asked what a “corporate knight” was and if he could become one. I didn’t have the heart to tell him no, but according to Arthurian legend, his role counselling governments on the costly risks of delaying action on climate change would be more akin to Merlin, King Arthur’s adviser, prophet and magician. But his question of what and who is a corporate knight has lingered, and is in need of some clarification. 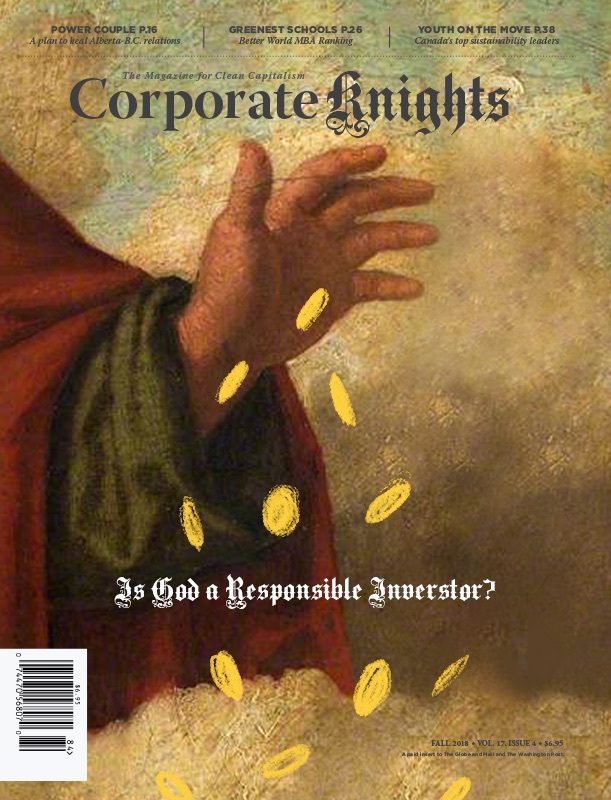 First, corporate knighthood is not bestowed solely through devotion to corporate social responsibility (CSR), which is about large businesses responding to the unintended consequences their operations create in the world – such as Shell stepping up its CSR initiatives in the wake of the company’s alleged complicity in the Nigerian government’s execution of activist Ken Saro-Wiwa in 1995. That is one of the reasons Corporate Knights rankings like our annual Global 100 place no weight on philanthropy, which is about giving away (usually less than 1 per cent of profits) rather than creating value. The noble Knights of the Round Table of King Arthur’s court were no slouches on the battlefield, but they fought for justice and adhered to a moral code of bravery, courtesy, honour and great gallantry toward the vulnerable. The corporate knights of the 21st century are not that different at their essence, comprised of noble business leaders (all genders) with a moral code beyond making money to creating value for society, with exemplars like Paul Polman and Elon Musk. Corporate knaves have no moral code and they do not create value for society. One that comes to mind is pharma bro Martin Shkreli, who bought a life-saving medicine in 2015 before jacking the price up from $13.50 to $750 per pill. “I did it for my shareholders’ benefit because that’s my job,” he explained. “The political risk is being shamed – and shame isn’t dilutive to earnings per share.” Shkreli eventually ended up in jail, although he did make money for many of his shareholders along the way. Warren Buffett is one of the greatest investors ever, but he is no corporate knight. It’s not that he lacks a moral code, which he articulates as “do nothing you would not be happy to have an unfriendly but intelligent reporter write about on the front page of a newspaper.” It’s certainly not that he hasn’t made money for his shareholders or that he is not generous with his own winnings, which are mostly dedicated to charity under the guiding hand of his bridge partner at the Gates Foundation. Now that Buffett has thrown his lot in with aggressive Brazilian private equity fund 3G, he is in danger of becoming a corporate raider, as was the case with 3G-owned Kraft Heinz’s aborted $143 billion (U.S.) hostile takeover attempt of Unilever this past summer. 3G’s modus operandi is to acquire, fire, cut, sell and eliminate anything that isn’t nailed down. Which brings us back to Paul Polman, who had a long conventional career at Nestlé before being passed over for CEO and then jumping to the top job at Unilever. During his reign, he has redefined the purpose of the company to “make sustainable living commonplace,” cancelled quarterly earnings guidance as an affront to the myopia of short-term capitalism and boldly set out to double sales while halving environmental impact. Oh, and the share price has doubled in the past five years. Interestingly, Polman has even banned the term corporate social responsibility. And there is Elon Musk. He’s come a long way since his dollar-a-day diet in Montréal and internship under Peter Nicholson at Scotiabank in the early ’90s. Musk cites two books that instilled his moral compass: William Golding’s classic Lord of the Flies, whose hero Ralph wants to create a moral code to save humanity from a Hobbesian fate, and Foundation by Isaac Asimov, where one man tries to save the world from a fast-approaching descent into ignorance and warfare by creating an alternate empire in which science, technology and the arts provide refuge to people. Not that he’s keeping score, but Musk’s financial worth is an estimated $16 billion with a lot of his shareholders benefiting along the way. His value to society is priceless. On a hot, flat, hungry and crowded planet, there is a big market (estimated by the UN at $12 trillion by 2030) for businesses that create more value for society than they take away through negative externalities. This is fertile ground for a rising movement of corporate knights to roam in the quest for a sustainable world.